In the 1920s most of the rivers south of Franz Josef were not yet bridged, and travel in South Westland was slow and difficult. 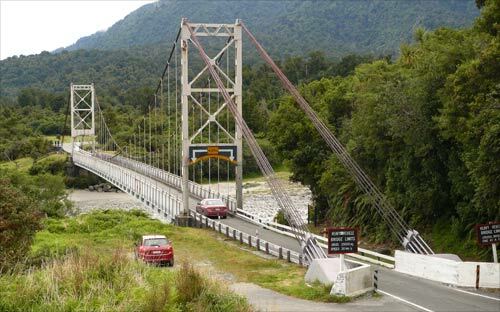 Over the next two decades a series of single-lane suspension bridges were built, similar in design to this one at the Karangarua River. With a 130-metre span, it is the longest single-suspension span still in use in New Zealand. Archdeacon James Young often found his travels delayed in South Westland before bridges were built. In the accompanying story he tells of the difficulty of conducting a wedding when the bride and the groom were on the far side of a flooded river. It is not clear which river he is describing, but it may have been the Karangarua. Download the PDF to read the story.